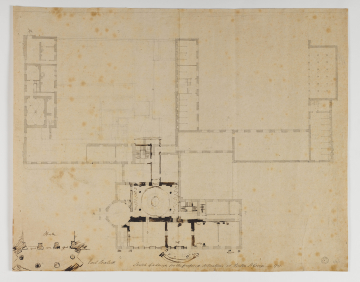 Soane had drawn-in over a general plan of the house and offices a design for a new entrance on a segmental plan and the re-shaping of the reception rooms shown on drawing  dated 15 October 1796. It seems that  should precede  but nevertheless it is dated 1797. There is an interior perspective of the Saloon in the British architectural drawings collection of Yale University, U.S.A.(copy in SM files) which shows a canopy domed ceiling with a circular lantern. 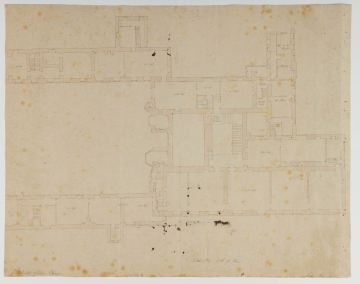 This may relate to Soane's sketchy plan of the Saloon in the drawing catalogued here and also drawing . See drawings  and  for alternative ceiling designs.